Cardiac’s powers derive from his artificial components and so-called "Beta Technology." His heart has been surgically replaced with a compact beta particle reactor, and his skin has been covered in a vibranium mesh neural web, which channels the beta particles into his muscles. 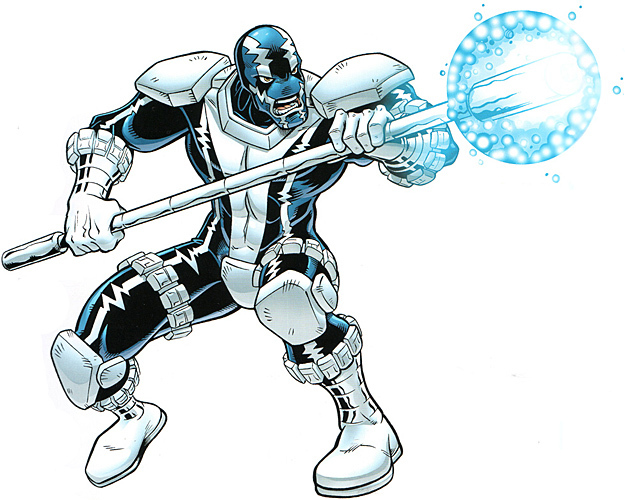 Enhanced Abilities: Cardiac’s strength, agility speed, durability and endurance have all been enhanced to superhuman levels by his Beta-Technology. Pulse Staff: Cardiac is able to project beta energy through his pulse staff. Flight: Cardiac often uses a remote controlled, beta propelled stingray hand glider that attaches to his pulse staff. Early in his life, Elias "Eli" Wirtham lost his older brother, Josh, to a rare, incurable disease. As a result, he vowed to become a healer, and eventually became a doctor and built the most powerful medical and biological research empire on the East Coast. In acquiring an older chemical company, he learned they had discovered a miracle drug, which may have cured his brother, but they kept it off the market until the economic climate was more favourable. Enraged and embittered, Wirtham decided to strike out on those protected from punishment due to their position or technicality. He created the hi-tech devices to turn himself into a cyborg-vigilante, calling himself Cardiac.